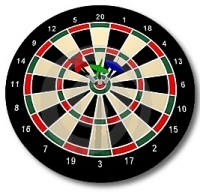 The Dart League meets each Thursday at 7:00 PM during the season which starts the beginning of September and ends the second week of April. In addition to throwing darts, the League enjoys the comforts of the Game Room and fellowship of other Red Men and Pocohantas in the Lounge during the games. Various times during the season food is provided for League members and there is room for new members to join.